Rise Of The Guardians, DreamWorks Animation’s latest big-budget offering, is every bit as bold as it is visually dazzling, rich in depth and expansive in scope. When the evil Pitch Black (Jude Law) threatens to instil fear in every child, the immortal Guardians – North (Alec Baldwin), Bunny (Hugh Jackman), Tooth (Isla Fisher), Sandman and new recruit Jack Frost (Chris Pine) – must band together to protect childhood innocence and optimism. First time director Peter Ramsey, working from a screenplay ably adapted from William Joyce’s beloved source material by screenwriter David Lindsay-Abaire, struggles at first to find his rhythm, with much of the first half burdened by exposition, as each of these colourful, attractive characters are introduced in succession and Pitch Black’s craven plan is unveiled. It can’t help but feel unnecessarily overcrowded and excessive, especially considering its only really Jack Frost’s story we’re supposed to be invested in. Surely enough, as the narrative crosses the midway point and its focus is pulled back and concentrated on Jack Frost’s enlightenment at the hands of a boys persistent belief and the teams intrepid efforts to stop Pitch Black in his tracks, Rise Of The Guardians enters its stride. From here, it competently and admiringly delivers on full-scale spectacle (the sleigh rides are nothing short of spectacular), witty back-and-forth banter and the kind of attention-to-detail commonly found in an Aardman production. The animation, as has become increasingly fortified with DreamWorks Animation productions, is rich, exuberant and an absolute wonder to behold. Whether it’s through a high-speed sleigh ride across the sky, an eerie flashback to a time when Pitch Black reigned supreme or the Sandman’s eminent dust streaks that take on a variety of shapes, emotions and representations, every single frame is imbued with a magical realism that lights up the screen from start to finish. The same, too, can be said for the characters who are distinctive spectacles in themselves. Praise must be awarded to the well chosen and equally dedicated cast, from Baldwin’s archaic warrior take on Santa Claus to Pine’s lost and disconcerted Jack Frost (his reliance on his magical, hooked staff perfectly reflects his insecurity), who bring honesty and vitality to their time-honoured characters. Their fervent, family-like chemistry enables the partnership to feel organic and for their power to appear much stronger than Pitch Black’s. It’s all set to a towering, orchestral score by Alexandre Desplat that further accentuates the magical realism that encapsulates the entire film. 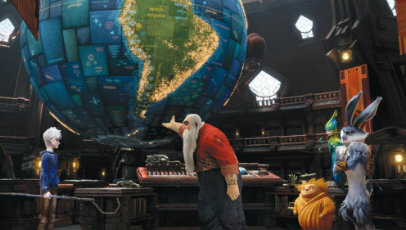 To that effect, Rise Of The Guardians operates best as a fantasy adventure, with a subtle, yet eloquent beating heart. Jack Frost’s transition from insular unbeliever to heroic adherent is a natural one, and one that is sure to encapsulate those willing to lend themselves – souls and all – for a pleasing, pronounced and wondrous ninety seven minutes. Next Post Film Reviews On The Radio – Who’d Have Thought It? Thanks for the review, I’ve been really wanting to see this movie!